This wood and stainless steel pooch loves to pry off bottle caps and hold them in his magnetic mouth. You've tried training Rex to fetch you a beer from the fridge and open it, but his lack of hands is kind of a problem. Short of such a talented canine bartender, try this adorable beech wood and stainless steel pooch. He loves to pry off bottle caps and hold them obediently in his magnetic mouth. He'll sit patiently on your countertop or bar until good humans earn another IPA treat, and you never have to walk him late at night (unless you're headed for the fridge, of course). Made in China. 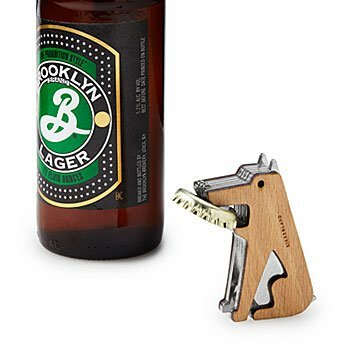 Darling item for dog and beer lovers! See above comments- nice piece! Unique, well made, stylish bottle opener. Came nicely package. This bottle opener is high quality and looks it. This is a darling conversation starter and useful tool for the kitchen. Caleb loved how heavy it felt in his hand. It works just like any other bottle opener but has a cute little personal touch due to the magnetic work. The item is adorable. A great item to display on your home bar. Once you figure out that you have to put the dog's mouth very low under the bottle cap it's easy to use. But it is heavier than your average bottle opener and awkward at first. And it looks like it could be a Swiss Army Knife. I purchased this item as a stocking stuffer for my adult son and my daughter's boyfriend. It is functional and yet whimsical too. So cute!